Yoga, a practice developed in India thousands of years ago, is now arguably one of the most popular forms of fitness in the world. But as anyone who has practiced yoga for a prolonged period of time can attest, yoga can be about much more than a good workout. Originally developed as a spiritual practice, it wasn’t until much later that yoga took the physical form, or asanas (poses), for which it is so widely known today. For students of living yoga, taking the practice into nature plays a vital role on the path. Contrast an overcrowded room with unnatural light, linear structures, a wall of mirrors and the thick stench of sweat to an open vista, a fresh mountain breeze, the ability to practice sun salutations facing the warming light of the sun, and tree poses that root deep into the heart of Mother Earth. When it comes to meditation, a pivotal practice in yoga, the stillness found in a calm lake that perfectly reflects the rich blue sky and craggy mountain peaks or the gentle flow of a creek can be a great teacher. Nature carries with it a link to ancestors and offers a window into the present moment, a place where time does not represent stress and deadlines, but rather a rhythm and a pulse that can be attuned through mindfulness. The benefits gained from this type of experience—transcending the ego and realizing a connection with all life—are tantamount to important issues like protecting the environment and creating a more peaceful and harmonious world. For those who live in densely populated city centers, interactions with nature can unfortunately be few and far between. Those fortunate enough to live at or visit Lake Tahoe have a unique opportunity not only to explore a vast and beautiful wilderness, but to use the wild and pristine nature found here to transform us. One way this can be done is through developing an outdoor yoga practice. 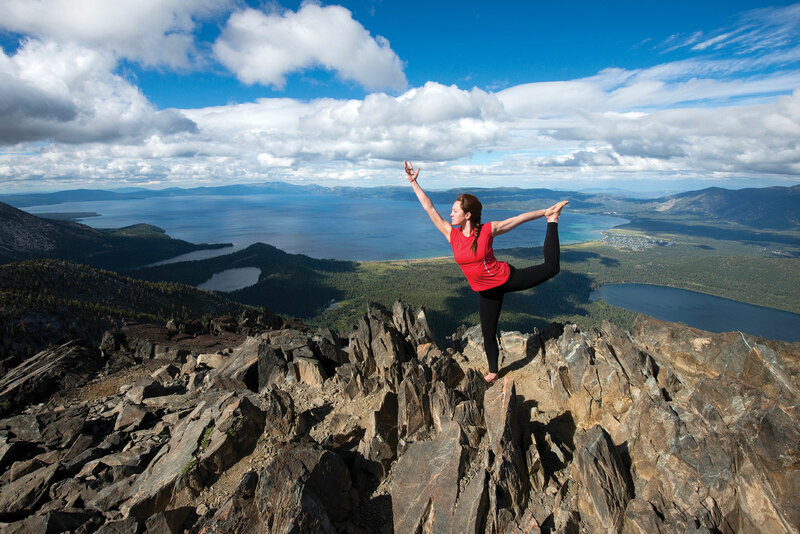 Tahoe is generous with its natural yoga spaces. In the South Lake Tahoe region, one can choose between practicing at Kiva Beach, with the possibility of a bald eagle soaring overhead, at an Emerald Bay lookout with osprey chicks calling out to their mother, or on granite plateaus at one of the many alpine lakes in Desolation Wilderness. Practitioners can choose from the East Shore’s sandy beaches, the West Shore’s grassy Page Meadows, a stand-up paddleboard off the North Shore or perhaps a quiet dock on Truckee’s Donner Lake. The opportunities for creating truly transformational yoga practices in nature are endless. One might think, “But I need a perfectly flat surface for my yoga mat.” First of all, the yoga mat is only a recent invention within the last century. The ancient practice thrived long before the introduction of the mat. Although yoga mats are nice and useful, it can be beneficial once in a while to practice without them. This can help us to get out of a linear mindset and begin thinking more cyclically. Second, slightly uneven surfaces can help to develop smaller, balance-oriented muscles that practitioners are not used to using. And hiking to do yoga is a great way to warm the muscles for a deeper stretch, leading to increased flexibility. With an abundance of fresh air, participants will find themselves breathing deeper, focusing more on breath and activating their olfactory senses. The vastness of nature will prompt them to extend their heart and limbs outward in the most expansive ways possible, building confidence, strength and power into their poses. And, of course, the quiet sounds of nature will help to calm the mind and bring practitioners deep into the present moment where a wellspring of gratitude and peace flows. Erica Hartnick leads mindful adventures and outdoor yoga classes in South Lake Tahoe and beyond. She is the co-founder of the community @yogatrade. Connect at www.ericahartnick.com.